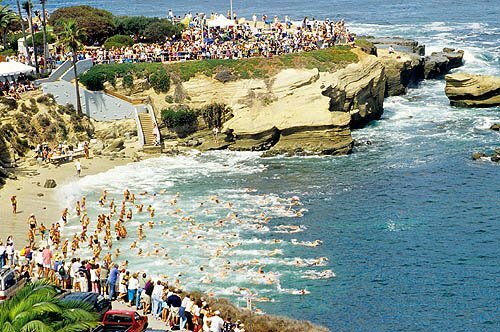 The La Jolla Rough Water Swim, America’s premier event of this type, takes place at the La Jolla Cove every year on the first Sunday in September. More than 2,000 swimmers churning up the water make for a memorable sight, and it’s not surprising that this is one of La Jolla’s most popular spectator events. Most competitors follow a triangular one-mile course, but elite swimmers opt for a more grueling Gatorman three-mile challenge. Juniors have a 250-yard option. I first saw the La Jolla Rough Water Swim because I happened to be having Sunday brunch with friends at Azul La Jolla on Prospect Street, which has a great view of the Cove. I still think Azul is the best viewpoint – so book early and request a window table. Click here for more information on the Rough Water Swim.